Embark on a journey of self-discovery and tranquility this month in honor of International Yoga Day (June 21st) by pushing yourself outside the comfort of your mat workout. Whether an avid yogi or experimenting with your first class, the practice of yoga not only helps keep you in shape but it also guarantees a path to a more zen-like enlightened lifestyle. 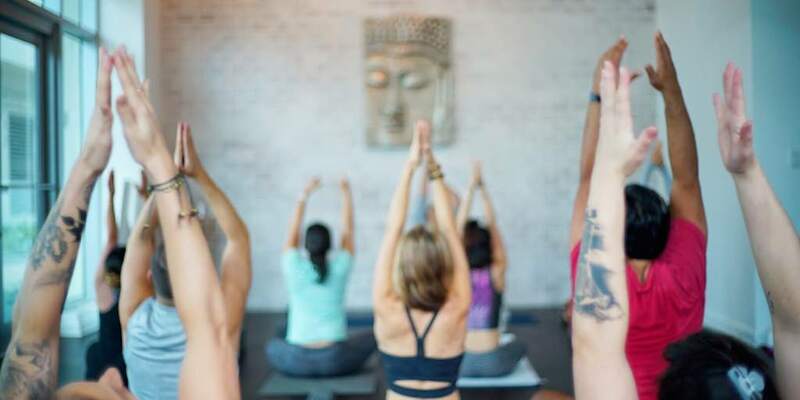 From Mysore Style yoga to the popular practice of heated Bikram and Vinyasa yoga, breathe out all your troubles and empower your inner chakras while disconnecting from a hectic city life by visiting some of Miami’s top yoga studios. A dedicated yogi, Haute 100-lister Arlene Chaplin has focused on the vinyasa and ashtanga practices of yoga. Combining Miami’s love for food and art with yoga was an idea that came to life through Arlene’s innovative incorporation of the three—now, famously known as YogArt. Partnering with Dawn Feinberg, YogArt’s co-creator and a widely recognized and respected instructor in South Florida’s yoga community, the two hold iconic yoga events like YogArt Basel, YogArt Design District and YogArt Buddhas & Bellinis, thousands of yogis in the Magic City are eagerly waiting year-round to attend the next event. Located in the Miami Design District, Ahana Yoga is a family-owned yoga studio boutique aiming to create a close-knit, loving community amidst Miami’s cosmopolitan backdrop. Invested in making the world a better place, this studio welcomes all levels from beginner to avid yogis. With five different classes, Ahana Yoga offers a traditional approach to ashtanga yoga asana—Mysore Style—consisting of a sequence of postures practiced in a quiet environment suited to fit the pace and needs of the individual. The studio also offers an hour-long ahana vinyasa flow class ideal for those looking for a fun and challenging yoga session. Explore the heights by getting your feet off the ground and entering a realm of deep floating relaxation at Ayama Yoga’s invigorating take on aerial vinyasa yoga. This anti-gravity yoga practice involves a series of exercises that combine a mixture of pilates, calisthenics and aerial acrobatics all while elevated off the ground on a hammock-like apparatus. Ideal for a total body workout, this class allows for a total connectivity of mind, body and spirit while strengthening your core muscles and improving flexibility. This Moksha Yoga community—better known as Moda Yoga—is an internationally renowned environmentally and socially conscious yogi community “collectively changing the world one hot yoga class at a time.” With the studio’s grand opening scheduled for June 27th, Miamians will soon be able to enjoy of the hot modo series specifically designed to deepen your practice. Both the Modo and Modo Flow series combine the foundations of traditional hatha and vinyasa yoga and therapeutic yoga practices that will challenge all yogi-levels. Nestled in the heart of Wynwood, the Sacred Space Miami offers a holistic and supportive community for those looking to cultivate a conscious healthy-living lifestyle. As part of the space’s wellness events, yogis can embark on the journey to reconnecting and empowering their chakras by attending daily practices of Sadhana yoga. Offered in the early hours of the morning, these sessions are aimed to help you unwind, clear your consciousness and connect with your inner-self as you move through different prayers, mantras and movement series. Providing a center for yogis to connect and recharge, Love Life & Wellness not only offers intensive and invigorating yoga classes but with the incorporation of the center’s café, this studio is an all-inclusive destination for the busy yogi. Disconnect from a hectic work week by taking the center’s kundalini spiritual transformation class and treat yourself to a deliciously prepped açai bowl afterwards.